Hi, my name is Ola, and I’m a guitarampoholic..
…and by that, I mean I share the passion for guitar gear with millions of others. My YouTube channel is my output, and that’s where I have received my following. I got tired of all the cam-sound gear tests that flourished over YouTube. My idea was simple, why not take the testing a step further with high quality video and audio. With that introduction, imagine my first time at NAMM, I was like a kid in a candy store with all the amps and gear everywhere! I had the chance to record as much amps as I wanted. But to be able to catch everything I would need to pack ALL my stuff, camera, microphones, computer, audio interface, headphones, cables. 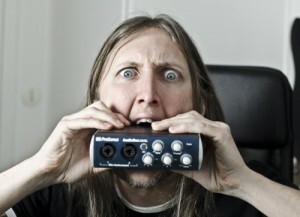 This is where PreSonus comes in. I was contacted by Ryan at PreSonus about borrowing a small interface that I could carry around as my mobile studio while recording all the guitar amplifiers at the show. Needless to say I got one from their booth, plugged it in, and it worked straight away. Sounded awesome as well! I have never experienced Presonus products other than hearing people praising them, but I am sure this is going to be a long-lasting relationship. During the show we filmed and recorded around 10-15 guitar amps. I didn’t need to worry about anything, everything was such a breeze. I could concentrate on recording the amps without needing to worry about hardware issues. We just went from booth to booth and got in a great flow. After the show I went home and got an AudioBox 22VSL for my home studio. I just had to get one, and now I use it for all my amp tests! Nice articles what you have shared. keep sharing like that.